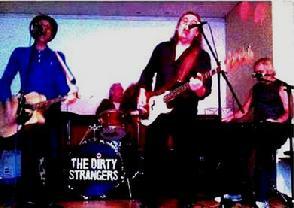 The Dirty Strangers performed for the past/present residents of Acton, West London on 2nd September 2012. An event that developed from a Facebook page, where Actonians gathered and shared memories of living in Acton. The band played in their usual effervescent and raunchy rhythm and blues style, encouraging a fair few vintage rock and rollers out of their seats. Their website write-up refers to the band as 'cosmopolitan, a bit rough around the edges and beating with a heart of gold' and I'm sure that the revellers agree they were well worth dancing to (I did!). The band came to be in the late 1970's and was essentially the brain-spark of Alan Clayton, a West Londoner born and 'unbred' in Shepherds Bush. Early sounds were influenced by punk, with eager tones of the likes of Eddie Cochran, Gene Vincent and Chuck Berry with a little bit of Otis Redding soul. Clayton has toured with the Rolling Stones on their 'Bigger Bang' tour of 2005-2007, prior to which they'd worked together with or without their relative bands. Both Keith Richards and Ronnie Woods have featured on Dirty Strangers' albums. Rock & Roll forever is a cert' wherever The Dirty Strangers choose to pluck, beat, stomp. They've appeared several times at the Ginglik in Shepherds Bush, London W12.